Cathie Rowand | The Journal Gazette IPFW's John Konchar looks to pass around Detroit's Roschon Prince in first-half action at the Memorial Coliseum on Tuesday. Bryson Scott scored a career-high 34 points as the IPFW men's basketball team defeated Detroit Mercy 91-82 at Memorial Coliseum on Tuesday. Scott went 10 of 18 from the field, 4 of 8 from 3-point range and a perfect 10 of 10 from the free-throw line. 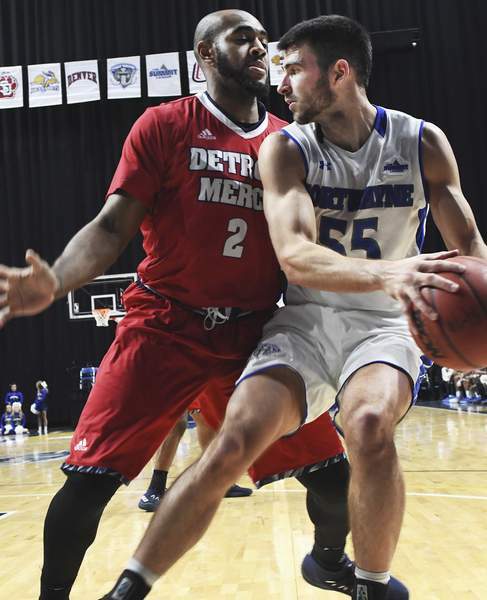 The Mastodons led by as much as 65-49 with 12:36 left in the game but the Titans responded with a 24-9 run in 7:26 of play to get within 74-73 with 5:10 left in the game. IPFW held strong and closed the game on a 17-9 run for the win. At the start of the game, the teams matched each other's baskets for the first three minutes until the Titans' Kameron Chatman scored a 3 to give Detroit (4-3) a 9-8 advantage. The Mastodons (4-3) responded with a 10-2 run to go up 18-11 but the Titans responded with a 21-10 run to go up 32-28 with 3:15 left in the half. IPFW closed the half on an 11-2 run to go into halftime up 39-34. John Konchar and Kason Harrell each scored 18 points and Konchar had a game-high 13 rebounds. Chatman led the Titans with 10 rebounds and 31 points on 11 of 15 shooting from the field, 5 of 6 from three and 4 of 6 from the free-throw line. Josh McFolley added 12 and Jermaine Jackson Jr, Corey Allen and Jaleel Hogan each added 11. Next, IPFW plays host to IU-Kokomo at 7 p.m. Thursday at the Coliseum.